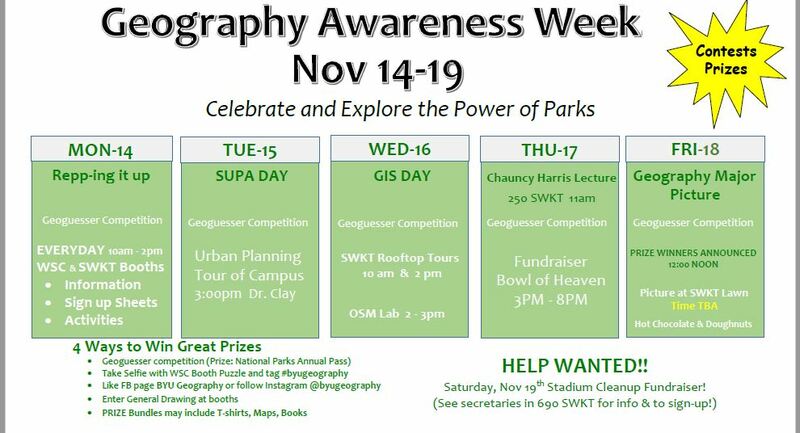 Fun, Prizes, and Free Stuff: Geography Awareness Week is This Week! Have you ever wanted to go onto the roof of the SWKT? Do you like competitions and prizes? If you answered “yes” to either of these questions, then the Geography Department’s Geography Awareness Week is the week-long festivity for you. This is an annual activity meant to make geography fun and interesting for everyone. 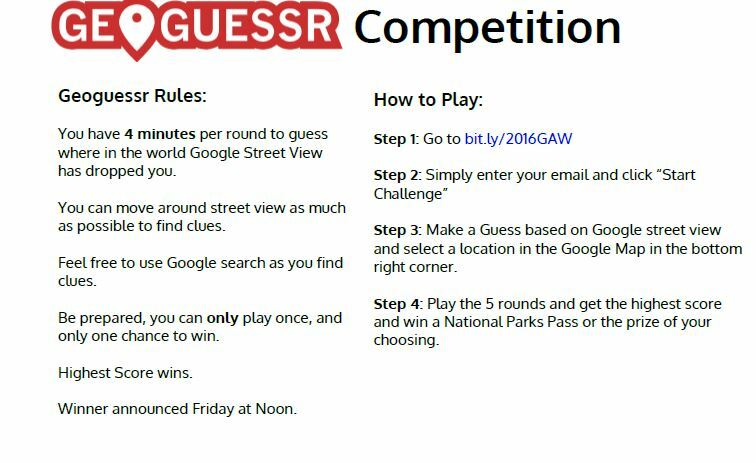 A week long Geoguesser competition. Similar to last year’s geocaching competition, this year’s competition will involve hunting for things to win a prize. This year’s prize, though, will be a national parkannual pass (an $80 value). Visit their booth in Brigham’s Square outside of the Booth in the WILK everyday from 10am to to 2pm with details on and sign up sheets. SWKT Rooftop tours from 10 a.m. and 2 p.m.
They’ll also have a Bowl of Heaven (1283 N University Ave #101,) fundraiser from 3 -8 p.m., in which 15% of your purchases will be donated to the Geography Club. Be sure to place your receipt in the fundraiser donation box! Geography Major Picture: All geography majors gather on the SWKT lawn (time TBA) for free hot chocolate and donuts and picture-taking! This event is bigger than just BYU’s Geography Department; it has in fact been going on around the country for more than twenty years.